This Saqqarah Beige Carre tapestry shows the stately and beautiful stone art from the sacred region of Saqqarah. Full of incredible pyramids, the famous step pyramid Djoser, and mastabas, the region of Saqqarah is also the site for the tomb of Ptah-hotep, a minister in ancient Egypt. 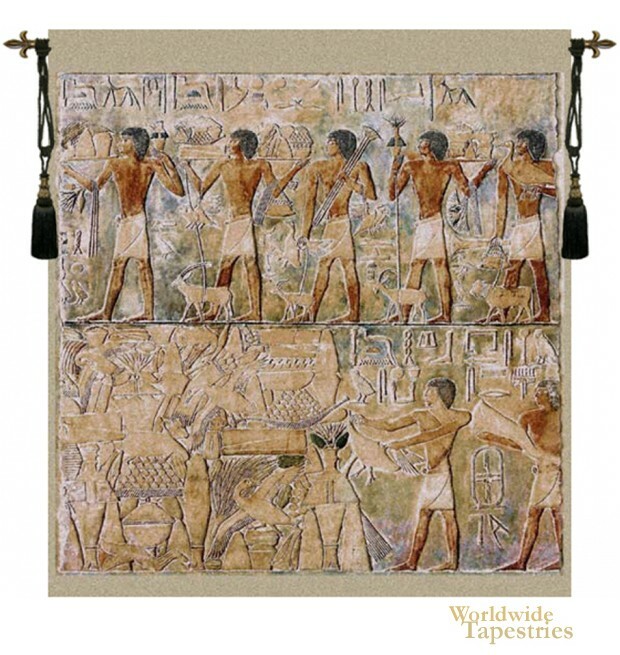 The design shows details of the daily life and technology in around 2150 BC including hieroglyphics above the procession. The color palette is beautiful and cohesive as we see beiges, browns, whites to portray the art on stone work very well. This Saqqarah Beige Carre tapestry is backed with lining and tunnel for easy hanging. Note: tapestry rod and tassels, where pictured, are purchased separately. Dimensions: W 54" x H 61"